Maria Lynch, Bonecas (2017), video screenshot. Courtesy of the artist and Wilding Cran. A simple reconfiguring of space at Wilding Cran has yielded a tiny, jewelbox of a gallery for small yet impactful exhibitions. Black Over White by Brazilian artist Maria Lynch is part of Pacific Standard Time LA/LA, the vast project supported by the Getty Foundation to produce exhibitions and education events related to Latin American and Latino art, in numerous venues across Southern California. Maria Lynch, Untitled 1 (2017), courtesy of the artist and Wilding Cran. 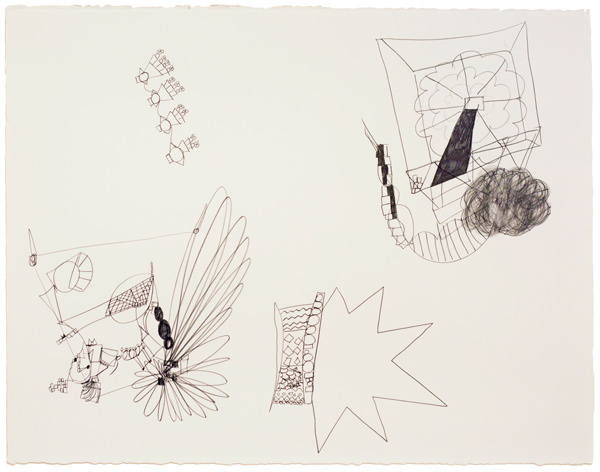 The six drawings in her show comprise a suite of investigations, essentially automatic drawings of ideas in process. All horizontal and varying negligibly in size, these works follow the description announced by the show’s title. They are graphite doodles on untreated paper, although Untitled 1 (2017) (they are all similarly titled, 1 through 6) has some white painting in small areas. 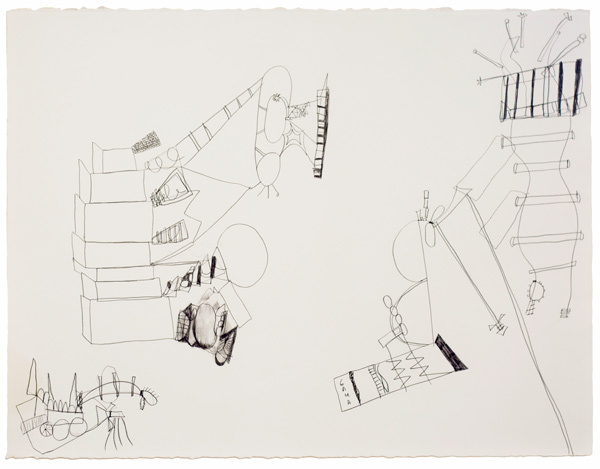 In numerical order the drawings feature battling robots and cricket balls, Jules Verne airships and conifer forests, a spiral staircase and daisy-chained flowerpots, stacked boxes and magic carpets, a vocal trio and rainbow clouds, conjoined olives and DNA strands. Though these sketchy works amuse they remain musings and give little insight as to what projects, if any, may spring from them.